Bodhidharma, Ukiyo-e woodblock print by Tsukioka Yoshitoshi, 1887. 1.1.3 "Chronicle of the Laṅkāvatāra Masters"
1.1.4 "Further Biographies of Eminent Monks"
The Western Regions in the first century BCE. The Western Regions was a historical name specified in the Chinese chronicles between the 3rd century BC to the 8th century AD that referred to the regions west of Yumen Pass, most often Central Asia or sometimes more specifically the easternmost portion of it (e.g. Altishahr or the Tarim Basin in southern Xinjiang). Sometimes it was used more generally to refer to other regions to the west of China as well, such as the Indian subcontinent (as in the novel Journey to the West). Blue-eyed Central Asian monk teaching an East Asian monk. A fresco from the Bezeklik, dated to the 9th or 10th century; although Albert von Le Coq (1913) assumed the red-haired monk was a Tocharian, modern scholarship has identified similar Caucasian figures of the same cave temple (No. 9) as ethnic Sogdians, an Eastern Iranian people who inhabited Turfan as an ethnic minority community during the phases of Tang Chinese (7th-8th century) and Uyghur rule (9th-13th century). At that time there was a monk of the Western Region named Bodhidharma, a Persian Central Asian. [note 4] He traveled from the wild borderlands to China. Seeing the golden disks on the pole on top of Yǒngníng's stupa reflecting in the sun, the rays of light illuminating the surface of the clouds, the jewel-bells on the stupa blowing in the wind, the echoes reverberating beyond the heavens, he sang its praises. He exclaimed: "Truly this is the work of spirits." He said: "I am 150 years old, and I have passed through numerous countries. There is virtually no country I have not visited. Even the distant Buddha-realms lack this." He chanted homage and placed his palms together in salutation for days on end. The Dharma Master was a South Indian of the Western Region. He was the third son of a great Indian king. His ambition lay in the Mahayana path, and so he put aside his white layman's robe for the black robe of a monk […] Lamenting the decline of the true teaching in the outlands, he subsequently crossed distant mountains and seas, traveling about propagating the teaching in Han and Wei. Tánlín's account was the first to mention that Bodhidharma attracted disciples, specifically mentioning Dàoyù (道育) and Dazu Huike (慧可), the latter of whom would later figure very prominently in the Bodhidharma literature. Although Tánlín has traditionally been considered a disciple of Bodhidharma, it is more likely that he was a student of Huìkě. "Chronicle of the Laṅkāvatāra Masters"
The teacher of the Dharma, who came from South India in the Western Regions, the third son of a great Brahman king." "Further Biographies of Eminent Monks"
Firstly, Dàoxuān adds more detail concerning Bodhidharma's origins, writing that he was of "South Indian Brahman stock" (南天竺婆羅門種 nán tiānzhú póluómén zhŏng). Secondly, more detail is provided concerning Bodhidharma's journeys. Tanlin's original is imprecise about Bodhidharma's travels, saying only that he "crossed distant mountains and seas" before arriving in Wei. Dàoxuān's account, however, implies "a specific itinerary": "He first arrived at Nan-yüeh during the Sung period. From there he turned north and came to the Kingdom of Wei" This implies that Bodhidharma had travelled to China by sea and that he had crossed over the Yangtze. Thirdly, Dàoxuān suggests a date for Bodhidharma's arrival in China. He writes that Bodhidharma makes landfall in the time of the Song, thus making his arrival no later than the time of the Song's fall to the Southern Qi in 479. Finally, Dàoxuān provides information concerning Bodhidharma's death. Bodhidharma, he writes, died at the banks of the Luo River, where he was interred by his disciple Dazu Huike, possibly in a cave. According to Dàoxuān's chronology, Bodhidharma's death must have occurred prior to 534, the date of the Northern Wei's fall, because Dazu Huike subsequently leaves Luoyang for Ye. Furthermore, citing the shore of the Luo River as the place of death might possibly suggest that Bodhidharma died in the mass executions at Heyin (河陰) in 528. Supporting this possibility is a report in the Chinese Buddhist canon stating that a Buddhist monk was among the victims at Héyīn. In the Anthology of the Patriarchal Hall (祖堂集 Zǔtángjí) of 952, the elements of the traditional Bodhidharma story are in place. Bodhidharma is said to have been a disciple of Prajñātāra, thus establishing the latter as the 27th patriarch in India. After a three-year journey, Bodhidharma reached China in 527, during the Liang (as opposed to the Song in Dàoxuān's text). The Anthology of the Patriarchal Hall includes Bodhidharma's encounter with Emperor Wu of Liang, which was first recorded around 758 in the appendix to a text by Shenhui (神會), a disciple of Huineng. Finally, as opposed to Daoxuan's figure of "over 180 years," the Anthology of the Patriarchal Hall states that Bodhidharma died at the age of 150. He was then buried on Mount Xiong'er (熊耳山 Xióng'ĕr Shān) to the west of Luoyang. However, three years after the burial, in the Pamir Mountains, Sòngyún (宋雲)—an official of one of the later Wei kingdoms—encountered Bodhidharma, who claimed to be returning to India and was carrying a single sandal. Bodhidharma predicted the death of Songyun's ruler, a prediction which was borne out upon the latter's return. Bodhidharma's tomb was then opened, and only a single sandal was found inside. According to the Anthology of the Patriarchal Hall, Bodhidharma left the Liang court in 527 and relocated to Mount Song near Luoyang and the Shaolin Monastery, where he "faced a wall for nine years, not speaking for the entire time", his date of death can have been no earlier than 536. Moreover, his encounter with the Wei official indicates a date of death no later than 554, three years before the fall of the Western Wei. Subsequent to the Anthology of the Patriarchal Hall, the only dated addition to the biography of Bodhidharma is in the Jingde Records of the Transmission of the Lamp (景德傳燈錄 Jĭngdé chuándēng lù, published 1004 CE), by Dàoyuán (道原), in which it is stated that Bodhidharma's original name had been Bodhitāra but was changed by his master Prajñātāra. The same account is given by the Japanese master Keizan's 13th century work of the same title. Several stories about Bodhidharma have become popular legends, which are still being used in the Ch'an, Seon and Zen-tradition. Bodhidharma: "There is no noble truth, there is only emptiness." This encounter was included as the first kōan of the Blue Cliff Record. Failing to make a favorable impression in South China, Bodhidharma is said to have travelled to the Shaolin Monastery. After either being refused entry or being ejected after a short time, he lived in a nearby cave, where he "faced a wall for nine years, not speaking for the entire time". The biographical tradition is littered with apocryphal tales about Bodhidharma's life and circumstances. In one version of the story, he is said to have fallen asleep seven years into his nine years of wall-gazing. Becoming angry with himself, he cut off his eyelids to prevent it from happening again. According to the legend, as his eyelids hit the floor the first tea plants sprang up, and thereafter tea would provide a stimulant to help keep students of Chan awake during zazen. The most popular account relates that Bodhidharma was admitted into the Shaolin temple after nine years in the cave and taught there for some time. However, other versions report that he "passed away, seated upright"; or that he disappeared, leaving behind the Yijin Jing; or that his legs atrophied after nine years of sitting, which is why Daruma dolls have no legs. Bodhidharma asked, "Can each of you say something to demonstrate your understanding?" Dao Fu stepped forward and said, "It is not bound by words and phrases, nor is it separate from words and phrases. This is the function of the Tao." Bodhidharma: "You have attained my skin." The nun Zong Chi[note 6][note 7] stepped up and said, "It is like a glorious glimpse of the realm of Akshobhya Buddha. Seen once, it need not be seen again." Bodhidharma; "You have attained my flesh." Dao Yu said, "The four elements are all empty. The five skandhas are without actual existence. Not a single dharma can be grasped." Bodhidharma: "You have attained my bones." Bodhidharma passed on the symbolic robe and bowl of dharma succession to Dazu Huike and, some texts claim, a copy of the Laṅkāvatāra Sūtra. Bodhidharma then either returned to India or died. Paint of Bodhidharma at Himeji Castle. Some Chinese myths and legends describe Bodhidharma as being disturbed by the poor physical shape of the Shaolin monks, after which he instructed them in techniques to maintain their physical condition as well as teaching meditation. He is said to have taught a series of external exercises called the Eighteen Arhat Hands and an internal practice called the Sinew Metamorphosis Classic. In addition, after his departure from the temple, two manuscripts by Bodhidharma were said to be discovered inside the temple: the Yijin Jing and the Xisui Jing. Copies and translations of the Yijin Jing survive to the modern day. The Xisui Jing has been lost. According to Southeast Asian folklore, Bodhidharma travelled from Jambudvipa by sea to Palembang, Indonesia. Passing through Sumatra, Java, Bali, and Malaysia, he eventually entered China through Nanyue. In his travels through the region, Bodhidharma is said to have transmitted his knowledge of the Mahayana doctrine and the martial arts. Malay legend holds that he introduced forms to silat. Vajrayana tradition links Bodhidharma with the 11th-century south Indian monk Dampa Sangye who travelled extensively to Tibet and China spreading tantric teachings. Three years after Bodhidharma's death, Ambassador Sòngyún of northern Wei is said to have seen him walking while holding a shoe at the Pamir Heights. Sòngyún asked Bodhidharma where he was going, to which Bodhidharma replied "I am going home". When asked why he was holding his shoe, Bodhidharma answered "You will know when you reach Shaolin monastery. Don't mention that you saw me or you will meet with disaster". After arriving at the palace, Sòngyún told the emperor that he met Bodhidharma on the way. The emperor said Bodhidharma was already dead and buried and had Sòngyún arrested for lying. At Shaolin Monastery, the monks informed them that Bodhidharma was dead and had been buried in a hill behind the temple. The grave was exhumed and was found to contain a single shoe. The monks then said "Master has gone back home" and prostrated three times: "For nine years he had remained and nobody knew him; Carrying a shoe in hand he went home quietly, without ceremony." Bodhidharma is traditionally seen as introducing dhyana-practice in China. It lets one see into [one's own true] nature and [thus] attain Buddhahood. Tanlin, in the preface to Two Entrances and Four Acts, and Daoxuan, in the Further Biographies of Eminent Monks, mention a practice of Bodhidharma's termed "wall-gazing" (壁觀 bìguān). Both Tanlin[note 8] and Daoxuan[web 5] associate this "wall-gazing" with "quieting [the] mind" (Chinese: 安心; pinyin: ānxīn). Daoxuan states, "The merits of Mahāyāna wall-gazing are the highest". In the beginning Dhyana Master Bodhidharma took the four-roll Laṅkā Sūtra, handed it over to Huike, and said: "When I examine the land of China, it is clear that there is only this sutra. If you rely on it to practice, you will be able to cross over the world." In other early texts, the school that would later become known as Chan Buddhism is sometimes referred to as the "Laṅkāvatāra school" (楞伽宗 Léngqié zōng). The idea of a patriarchal lineage in Ch'an dates back to the epitaph for Fărú (法如 638–689), a disciple of the 5th patriarch Hóngrĕn (弘忍 601–674). In the Long Scroll of the Treatise on the Two Entrances and Four Practices and the Continued Biographies of Eminent Monks, Daoyu and Dazu Huike are the only explicitly identified disciples of Bodhidharma. The epitaph gives a line of descent identifying Bodhidharma as the first patriarch. These famous biographies were non-sectarian. The Ch'an biographical works, however, aimed to establish Ch'an as a legitimate school of Buddhism traceable to its Indian origins, and at the same time championed a particular form of Ch'an. Historical accuracy was of little concern to the compilers; old legends were repeated, new stories were invented and reiterated until they too became legends. D. T. Suzuki contends that Chan's growth in popularity during the 7th and 8th centuries attracted criticism that it had "no authorized records of its direct transmission from the founder of Buddhism" and that Chan historians made Bodhidharma the 28th patriarch of Buddhism in response to such attacks. Eventually these descriptions of the lineage evolved into a continuous lineage from Śākyamuni Buddha to Bodhidharma. 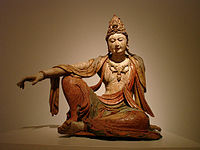 The idea of a line of descent from Śākyamuni Buddha is the basis for the distinctive lineage tradition of Chan Buddhism. Bodhidharma has been the subject of critical scientific research, which has shed new light on the traditional stories about Bodhidharma. It is ultimately impossible to reconstruct any original or accurate biography of the man whose life serves as the original trace of his hagiography – where "trace" is a term from Jacques Derrida meaning the beginningless beginning of a phenomenon, the imagined but always intellectually unattainable origin. Hence any such attempt by modern biographers to reconstruct a definitive account of Bodhidharma's life is both doomed to failure and potentially no different in intent from the hagiographical efforts of premodern writers. McRae's standpoint accords with Yanagida's standpoint: "Yanagida ascribes great historical value to the witness of the disciple T'an-lin, but at the same time acknowledges the presence of "many puzzles in the biography of Bodhidharma". Given the present state of the sources, he considers it impossible to compile a reliable account of Bodhidharma's life. Several scholars have suggested that the composed image of Bodhidharma depended on the combination of supposed historical information on various historical figures over several centuries. Bodhidharma as a historical person may even never have actually existed. Dumoulin comments on the three principal sources. The Persian heritage is doubtful, according to Dumoulin: "In the description of the Lo-yang temple, bodhidharma is called a Persian. Given the ambiguity of geographical references in writings of this period, such a statement should not be taken too seriously." Dumoulin considers Tan-lin's account of Bodhidharma being "the third son of a great Brahman king" to be a later addition, and finds the exact meaning of "South Indian Brahman stock" unclear: "And when Tao-hsuan speaks of origins from South Indian Brahman stock, it is not clear whether he is referring to roots in nobility or to India in general as the land of the Brahmans." These Chinese sources lend themselves to make inferences about Bodhidharma's origins. "The third son of a Brahman king" has been speculated to mean "the third son of a Pallavine king". Based on a specific pronunciation of the Chinese characters 香至 as Kang-zhi, "meaning fragrance extreme", Tsutomu Kambe identifies 香至 to be Kanchipuram, an old capital town in the state Tamil Nadu, India. According to Tsutomu Kambe, "Kanchi means 'a radiant jewel' or 'a luxury belt with jewels', and puram means a town or a state in the sense of earlier times. Thus, it is understood that the '香至-Kingdom' corresponds to the old capital 'Kanchipuram'." The Pakistani scholar Ahmad Hasan Dani speculated that according to popular accounts in Pakistan's northwest, Bodhidharma may be from the region around the Peshawar valley, or possibly around modern Afghanistan's eastern border with Pakistan. In the context of the Indian caste system the mention of "Brahman king" acquires a nuance. Broughton notes that "king" implies that Bodhidharma was of a member of the thondaiman caste, an shatriya caste of warriors and rulers. Brahman is, in western contexts, easily understood as Brahmana or Brahmin, which means priest. According to tradition Bodhidharma was given this name by his teacher known variously as Panyatara, Prajnatara, or Prajñādhara. His name prior to monkhood is said to be Jayavarman. Bodhidharma’s name appears sometimes truncated as Bodhi, or more often as Dharma (Ta-mo). In the first case, it may be confused with another of his rivals, Bodhiruci. Tibetan sources give his name as "Bodhidharmottāra" or "Dharmottara", that is, "Highest teaching (dharma) of enlightenment". Buswell dates Bodhidharma abode in China approximately at the early 5th century. Broughton dates Bodhidharma's presence in Luoyang to between 516 and 526, when the temple referred to—Yǒngníngsì (永寧寺), was at the height of its glory. Starting in 526, Yǒngníngsì suffered damage from a series of events, ultimately leading to its destruction in 534. Traditionally Bodhidharma is credited as founder of the martial arts at the Shaolin Temple. However, martial arts historians have shown this legend stems from a 17th-century qigong manual known as the Yijin Jing. As for the "Yi Jin Jing" (Muscle Change Classic), a spurious text attributed to Bodhidharma and included in the legend of his transmitting martial arts at the temple, it was written in the Ming dynasty, in 1624, by the Daoist priest Zining of Mt. Tiantai, and falsely attributed to Bodhidharma. Forged prefaces, attributed to the Tang general Li Jing and the Southern Song general Niu Gao were written. They say that, after Bodhidharma faced the wall for nine years at Shaolin temple, he left behind an iron chest; when the monks opened this chest they found the two books "Xi Sui Jing" (Marrow Washing Classic) and "Yi Jin Jing" within. The first book was taken by his disciple Huike, and disappeared; as for the second, "the monks selfishly coveted it, practicing the skills therein, falling into heterodox ways, and losing the correct purpose of cultivating the Real. The Shaolin monks have made some fame for themselves through their fighting skill; this is all due to having obtained this manuscript." Based on this, Bodhidharma was claimed to be the ancestor of Shaolin martial arts. This manuscript is full of errors, absurdities and fantastic claims; it cannot be taken as a legitimate source. One of the most recently invented and familiar of the Shaolin historical narratives is a story that claims that the Indian monk Bodhidharma, the supposed founder of Chinese Chan (Zen) Buddhism, introduced boxing into the monastery as a form of exercise around a.d. 525. This story first appeared in a popular novel, The Travels of Lao T’san, published as a series in a literary magazine in 1907. This story was quickly picked up by others and spread rapidly through publication in a popular contemporary boxing manual, Secrets of Shaolin Boxing Methods, and the first Chinese physical culture history published in 1919. As a result, it has enjoyed vast oral circulation and is one of the most "sacred" of the narratives shared within Chinese and Chinese-derived martial arts. That this story is clearly a twentieth-century invention is confirmed by writings going back at least 250 years earlier, which mention both Bodhidharma and martial arts but make no connection between the two. ↑ 1.0 1.1 See also South India, Dravidian peoples, Tamil people and Tamil nationalism for backgrounds on the Tamil identity. Dàoxuān's Further Biographies of Eminent Monks (7th century CE). "[O]f South Indian Brahman stock" c.q. "a Brahman monk from South India" (Further Biographies, 645). Broughton further notes: "The guide's Bodhidharma is an Iranian, not an Indian. There is, however, nothing implausible about an early sixth-century Iranian Buddhist master who made his way to North China via the fabled Silk Road. This scenario is, in fact, more likely than a South Indian master who made his way by the sea route." ↑ According to Jorgensen, the mentioning by Yáng Xuànzhī of Bodhidharma as Persian is mistaken, since the Sassanian realm was not Buddhist. Johnston supposes that Yáng Xuànzhī mistook the name of the south-Indian Pallava dynasty for the name of the Sassanian Pahlavi dynasty; however, Persian Buddhists did exist within the Sassanian realm, particularly in the formerly Greco-Buddhist east, see Persian Buddhism. ↑ Dàoxuān records that Huìkě's arm was cut off by bandits. ↑  translates 壁觀 as "wall-examining". ↑  offers a more literal rendering of the key phrase 凝住壁觀 (níngzhù bìguān) as "[who] in a coagulated state abides in wall-examining". ↑ viz.,  where a Tibetan Buddhist interpretation of "wall-gazing" as being akin to Dzogchen is offered. ↑ Dumoulin, Heisig & Knitter 2005, p. 85-90. ↑ 3.0 3.1 3.2 3.3 Dumoulin, Heisig & Knitter 2005, p. 88. ↑ 4.0 4.1 4.2 4.3 4.4 4.5 Broughton 1999, p. 54–55. ↑ 5.0 5.1 5.2 5.3 5.4 5.5 Broughton 1999, p. 8. ↑ 6.0 6.1 6.2 6.3 6.4 McRae 2003, p. 26. ↑ 7.0 7.1 7.2 7.3 7.4 7.5 Dumoulin, Heisig & Knitter 2005, p. 89. ↑ 8.0 8.1 8.2 8.3 Dumoulin, Heisig & Knitter 2005, p. 87. ↑ Broughton 1999, p. 54-55. ↑ 11.0 11.1 11.2 11.3 11.4 Kambe & (year unknown). ↑ 14.0 14.1 Edou 1996. ↑ Macmillan (publisher) 2003, p. 57, 130. ↑ 17.0 17.1 Jorgensen 2000, p. 159. ↑ Tikhvinskiĭ, Sergeĭ Leonidovich and Leonard Sergeevich Perelomov (1981). China and her neighbours, from ancient times to the Middle Ages: a collection of essays. Progress Publishers. p. 124. ↑ Hansen, Valerie (2012), The Silk Road: A New History, Oxford University Press, p. 98, ISBN 978-0-19-993921-3. ↑ 22.0 22.1 22.2 Broughton 1999, p. 9. ↑ Broughton 1999, p. 53. ↑ 24.0 24.1 Broughton 1999, p. 56. ↑ Broughton 1999, p. 139. ↑ 26.0 26.1 26.2 Broughton 1999, p. 2. ↑ 28.0 28.1 28.2 Lin 1996, p. 182. ↑ Broughton 1999, p. 119. ↑ 30.0 30.1 Cook 2003. ↑ Broughton 1999, pp. 2–3. ↑ 32.0 32.1 Maguire 2001, p. 58. ↑ Watts 1962, p. 106. ↑ 34.0 34.1 34.2 Lin 1996, p. 183. ↑ Dumoulin, Heisig & Knitter 2005, p. 86. ↑ 36.0 36.1 Broughton 1999, p. 62. ↑ Broughton 1999, p. 132. ↑ Faure 1986, p. 187-198. ↑ 40.0 40.1 40.2 Garfinkel 2006, p. 186. ↑ Wong 2001, p. Chapter 3. ↑ Haines 1995, p. Chapter 3. ↑ Edou 1996, p. 32, p.181 n.20. ↑ Watts 1958, p. 32. ↑ Dumoulin, Heisig & Knitter 2005, p. 85. ↑ Dumoulin, Heisig & Knitter 2005, p. 102. ↑ Broughton 1999, pp. 9, 66. ↑ Red Pine 1989, p. 3, emphasis added. ↑ 50.0 50.1 Dumoulin, Heisig & Knitter 2005, p. 96. ↑ Broughton 1999, p. 67–68. ↑ Dumoulin, Heisig & Knitter 2005, p. 52. ↑ Kohn 1991, p. 125. ↑ Sutton 1991, p. 1. ↑ Dumoulin 1993, p. 37. ↑ Cole 2009, p. 73–114. ↑ Yampolski 2003, p. 5-6. ↑ Suzuki 1949, p. 168. ↑ Suzuki 1948, p. 50. ↑ Diener 1991, p. 266. ↑ McRae 2003, p. 24. ↑ McRae 2003, p. 25. ↑ Chaline 2003, pp. 26–27. ↑ Dumoulin, Heisig & Knitter 2005, p. 89-90. ↑ Dumoulin, Heisig & Knitter 2005, p. 90. ↑ Goodman 1992, p. 65. ↑ Buswell & unknown, pp. 57, 130. ↑ Broughton 1999, p. 55. ↑ Broughton 1999, p. 138. ↑ Shahar 2008, pp. 165–173. ↑ Henning 2001, p. 129. Dumoulin, Heinrich (1993), "Early Chinese Zen Reexamined: A Supplement to Zen Buddhism: A History" (PDF), Japanese Journal of Religious Studies, 20 (1): 31–53, ISSN 0304-1042, archived from the original (PDF) on 2009-03-04 . Ferguson, Andrew. Zen's Chinese Heritage: The Masters and their Teachings. Somerville: Wisdom Publications, 2000. ISBN 0-86171-163-7. Hu, William; Bleicher, Fred (1965), "The Shadow of Bodhidharma", Black Belt Magazine, Black Belt Inc. (May 1965, Vol. III, No. 5): 36–41. McRae, John R. (2000), "The Antecedents of Encounter Dialogue in Chinese Ch'an Buddhism", in Heine, Steven; Wright, Dale S., The Kōan: Texts and Contexts in Zen Buddhism, Oxford University Press . Zvelebil, Kamil V. (1987), "The Sound of the One Hand", Journal of the American Oriental Society, Journal of the American Oriental Society, Vol. 107, No. 1, 107 (1): 125–126, doi:10.2307/602960, JSTOR 602960 . ↑ "The Committee of Western Bhikshunis". thubtenchodron.org. ↑ Zen Nun. "WOMEN IN ZEN BUDDHISM: Chinese Bhiksunis in the Ch'an Tradition". geocities.com. Archived from the original on 27 October 2009. ↑ Denkoroku Archived September 1, 2006, at the Wayback Machine. ↑ Simon Child. "In The Spirit of Chan". Western Chan Fellowship. Wikimedia Commons has media related to Bodhidharma. This page was last edited on 2 October 2018, at 11:07.